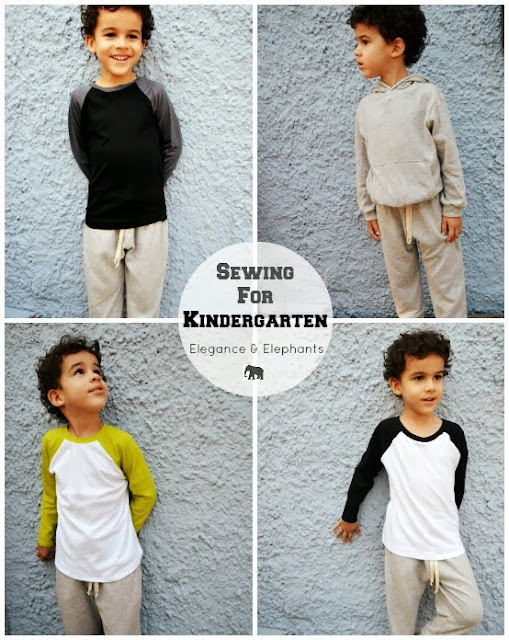 Sewing Like Mad: Sewing for Kindergarten - Elegance & Elephants. Beside the future heart breaker in the photo below we are also getting a visit from his Mom the AMAZING Heidi from Elegance & Elephants. She is the lady behind some very popular pdf sewing patterns: The Ruffle Top/dress and the Bubble Pocket Shorts that I both had the honor to pattern test for her. Her newest pattern The Fedora Hat is on my to-do list for sure! She is also the person you don't want to be in a competition with because she usual wins, haha. Fully deserved and all! Tobias (the future heart breaker...I mean, seriously!) is doing a combination that I did not know existed. He is partly being home schooled by Heidi and partly going to a private school. When he is in school a uniform is required so Heidi have sewed this perfect home attire for him for the other days.